Abstract: Data management has become one of the central issues in high-throughput screening. In particularl High-Content Screening applying automated microscopy requires a system, which is capable of storing and analyzing vast amounts of data. These data include comprehensive information about the bioactive molecules, the targeted genes, the physical plates, the assays, and images as well as their extracted data matrices after acquisition and analysis. 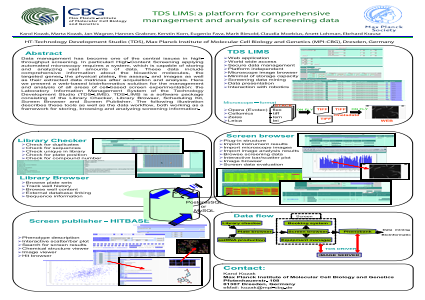 Here we present a web-based bioinformatics solution for the management and analysis of all areas of cell-based screen experimentation: the Laboratory Information Management System of the Technology Development Studio (TDS-LIMS). TDS-LIMS is a software package consisting of the Library Checker, Library Browser, Scheduling Kit, Screen Browser and Screen Publisher. The following illustration describes these tools as well as the data workflow, both working as a framework for storing, browsing and analyzing screening information. Summary: Here we present a web-based bioinformatics solution for the management and analysis of all areas of cell-based screen experimentation: the Laboratory Information Management System of the Technology Development Studio (TDS-LIMS). TDS-LIMS is a software package consisting of the Library Checker, Library Browser, Scheduling Kit, Screen Browser and Screen Publisher.